Years of experience and advanced cosmetic dentistry courses have made Dr. Canzoneri an expert when it comes to smile makeovers. He believes that only you know what you want from your smile. To deliver your “ideal” smile, he must understand your vision! Every smile makeover begins with a face-to-face discussion about goals and expectations. 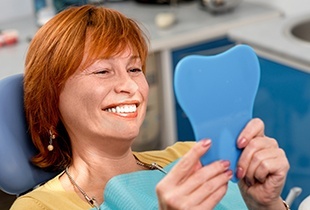 You and the dentist may review before-and-after photos of other smile makeovers. Feel free to bring pictures of smiles you admire, and the two of you will be able to better pinpoint the features you like that can be replicated in your new smile. So what is a smile makeover? Simply put, a smile makeover is a custom combination of procedures that accomplish your goal: a sensational smile. Your treatment plan may include porcelain veneers, cosmetic bonding, a laser gum lift, white crowns, white fillings, or replacement teeth. Every case is unique, and Dr. Canzoneri treats no two patients alike. He will act as your consultant and guide to plan a smile makeover that works for you. If you’re concerned about discomfort in the dental chair or if you suffer from dental anxiety, be sure to ask about sedation dentistry. If finances are a worry, consider third-party financing with CareCredit. Please share your concerns with our team, and we’ll help you find a way to make your dream smile a reality!